Kids Room Project: Decorate 2 Fabric on the Walls! I covered the first phase of the kids play-room transformation in this blog post along with a recipe for making your own homemade super cheap fabric starch. The following fabric creations are all adhered to the wall using that homemade starch. The idea was to create a woodland forest for Calebs side of the room and a magical fairy tale twist for Noelle’s side. There were two sections of fabric I had selected as a low wall-paper-like border for both sides of the room to help set the themes. After cutting the fabric in half down the middle to get the usable prints needed the next phase was to saturate them in the liquid cornstarch. Once thoroughly soaked the excess was squeezed out and operation plaster the wall in fabric began. The fabric stuck fairly easily to the wall and I used a sponge soaked in extra starch to smooth out bubbles and make sure the wet fabric was in full contact with the wall all the way across. For these lower sections I left the “ends” sticking out and came back with a razor knife after the fabric was dry to trim the edges. I rough cut out the fabric to go over the outlets once it was up on the wall but waited until the fabric was dry to trim tightly around the outlet with a razor knife. Wet fabric doesn’t cut very well fwiw and it is much easier to trim excess fabric or stray strings etc. after it has dried. First section of Noelle's fabric wall paper border while still wet. You can see the rough cut-out for outlet that will be trimmed later after it is dry. Second section of Noelle's fabric wall border. Neatly trimmed after drying. With the large sections of fabric wall-paper borders out of the way it was time for the fun and really creative part. Using brown paper bags from Whole Foods I sketched some templates to use as patterns for the various odds and ends of fabric I either had on hand from previous projects or bought specifically from Goodwill for this occasion. Important side note: I did discover via trial and error that lighter weight fabrics work better-faster and easier for sticking to the wall than heavier fabrics. Some of the following was made out of heavier fabric but it took a LOT more work and may have to be repaired with additional starch to stay “stuck” where they are supposed to for the long haul. Armed with my handy sketched templates I proceeded to cut various creatures out of fabric. Using cheap craft paint from Hobby Lobby accents and features were added to the fabric base. Once Paint was thoroughly dry fabric was saturated in corn starch and pressed to the walls. These smaller fun accent pieces went very fast and were not nearly as tedious as the larger pieces of fabric for the wall border. On the back wall a bright and happy sun was attached. Two fabric trees were created out of strips of cloth cut from a brown tablecloth. Details on the trees were all cut out of cloth. The leaves were made out of an old pair of Camo pants. Accents on details were painted on with craft paint. On Noelle’s side of the room I wanted to keep it fun and light with an underlying fairy-tale like theme. The flowers were cut out of cloth and accents painted on. On Noelle’s side of the room is the alcove that we painted blue. I found some paper and wire butterflies and dragonflies on clearance at HobbyLobby. These were hung from the ceiling and the walls decorated with fabric butterflies cut from the old sheet obtained at Goodwill. Over the alcove window I hung a fairy painting I did last Winter. One wall was especially meaningful to me. Butterflies came to symbolize hope and restoration in a lot of ways to me as I emotionally processed our lost babies. This wall is in memory of our kids who won’t play in this room and in honor of my friends who are still in the process of hoping and praying for babies of their own to hold and love. When you come into the room this is the scene. Hoping to get a comfortable chair that will hold me, Noelle and Caleb to create a reading nook. All in all it has been a totally fun project. Once I get past having this baby in a few weeks I have a few more ideas brewing for the rest of the house. It was SO easy, so much fun and unlimited potential for creative expression. Have I mentioned the best part of all? Once the fabric is dried to the wall it can be pulled off in less than a second and any residual corn starch wiped off with a damp cloth. No damage to paint whatsoever. Super-easy. The past couple of weeks have been rough. I’ve struggled with energy like never before and bouts of light-headedness and several days where I’ve been forced to spend most of the days flat on my back. A phone consult with my wonderful thyroid Dr. going over my most recent bloodwork at least explains the “why” behind my feeling so bad. The good news is as far as we know the bad numbers should not hurt Caleb. The bad news is it is doubtful I’m going to recover or feel any better between now and the birth. Trying to psych myself up for six weeks or so of being a semi invalid. Also trying not to feel overwhelmed by all the semi-last minute things I’ve put off in the baby-prep department. Hoping I get a burst of nesting energy despite it all that will help me get some things done that reallyREALLY need to be before this guy arrives! This past week I took my down time to tackle some crocheting projects that have been neglected over the summer. First I put an end to an overly ambitious King Sized blanket project that I realized would likely never get finished. Doodlebug lost the blanket I had crocheted for her as a baby and had been asking me for a blanket for a while. So, I pieced together the patches intended for the King sized blanket and it was the perfect size for the Doodlebug. Each square was crocheted out of fuzzy Bamboo yarn. So.incredibly.snuggly. There just are no words. Once the blanket was finished I surveyed the remaining pile of fuzzy Bamboo yarn and decided to try to figure out how to make some winter hats. Etsy never fails to inspire me with all the hat cuteness that exists out there but a) I don’t have the money to buy them pre-made and b) I can’t follow directions to save my life. My crocheting is completely self taught and I find tutorials for the most part impossibly confusing, especially with all the abbreviations. Ugh. So I first tackled a hat for the Doodlebug. She *loves* it. 🙂 It’s been worn every.single.day. since it was made. Next I attempted a baby-boy hat. Without knowing the head size of the baby it involved too much guess-work for my taste but Doodles insisted it was perfect and proceeded to model it on her doll while wearing hers. I found one of her dolls with a more realistic sized new-born head and tried the baby hat on for size. Both of those very simple hats successfully accomplished I moved onto a bigger challenge. Instead of using the fuzzy bamboo yarn that has a bit of forgiving give to it in regards to sizing I used a 100% cotton yarn I had left over from another project. The general idea behind this one was to have a lighter weight hat with ear-flaps. Again, no pattern, just figured it out as I went along. It needs to be tweaked but I would like to make it again! The purple is cotton and it’s trimmed in bamboo. The ear-flaps are leaves with vine like ties coming down created out of a crocheted and braided bamboo yarn. The dark leaf line details were stitched into the lighter colored crocheted leaf base. This flower was supposed to be a Pansy like flower but my lack of a pattern and complete lack of experience crocheting flowers ended up rendering it unrecognizable as any specific type of flower. The blue accents were sewn in with royal blue bamboo yarn. This flower was supposed to be a daisy then turned into a rose and then was again rendered unrecognizable as any specific type of flower by my lack of skill. Accents hand sewn in fuzzy red bamboo yarn. The accent vine at the top of the hat is supposed to be punctuated by little tiny yellow flowers. That was the general idea anyway. Next time I’d like to figure out how to include more flower specific detail. Last shot of the hat, side angle. Allow me to preface this post by saying that I am not a seamstress. I only remember ever successfully sewing one item of clothing in my life and that was a dress in my teens. A project closely aided by my Mom who happens to be an incredible seamstress. Sewing machines intimidate me and although the idea and creativity of sewing have always appealed to me the actual hair pulling frustrating logistics of it have made me keep it at arms length. Instead crocheting became my creative outlet of choice. 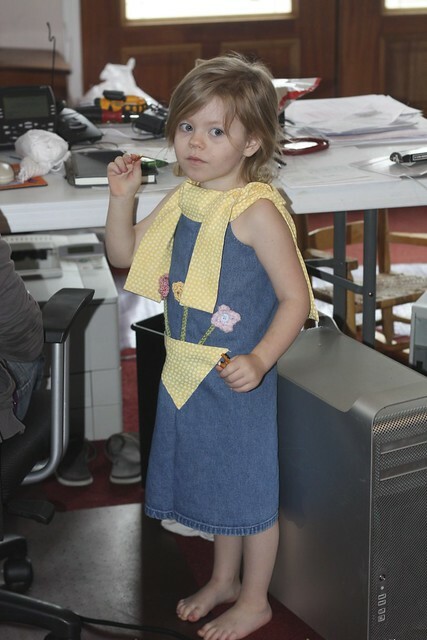 But I have this really cute three year old daughter. And there are sooo many wonderful ideas out there. Between cute patterns that can be made from scratch (personally rather intimidating to me, anything that requires a huge quadruple fold set of instructions with diagrams is enough to put me into a mild state of panic). The concept of recycling clothes into new clothes is a whole lot more appealing to me. It’s free styling. A lot of the seams and difficult structural aspects are already done. And, well, the whole frugal-responsible stewardship side of me really loves the idea of getting a second wear or two out of clothes that would otherwise be destined for the trash or Good-Will box. Last night I had a huge rush of inspiration. 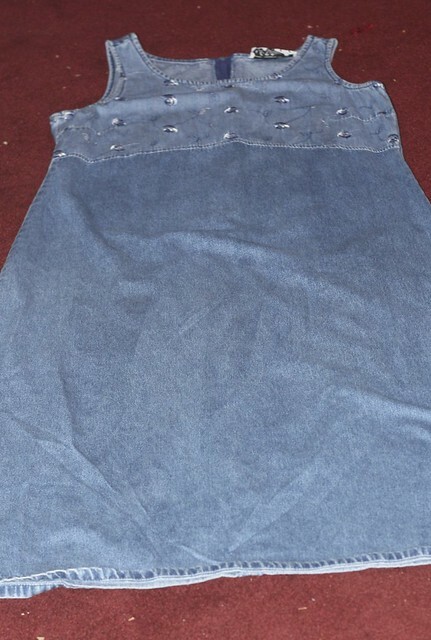 I saw an old denim jumper hanging in my closet. I’ve had this jumper since I was in my teens. Not sure why I’ve held onto it. It is not likely to ever fit me again. Pulling it off the hanger I held it up…and visions of possibilities danced before my eyes. I did mention that I am not a seamstress before, right? Well, along with not being a seamstress I also do not really possess even the basic requirements needed to take on a Re-Purposing project like the one that floated through my head. I started the project off by measuring my wee subject. 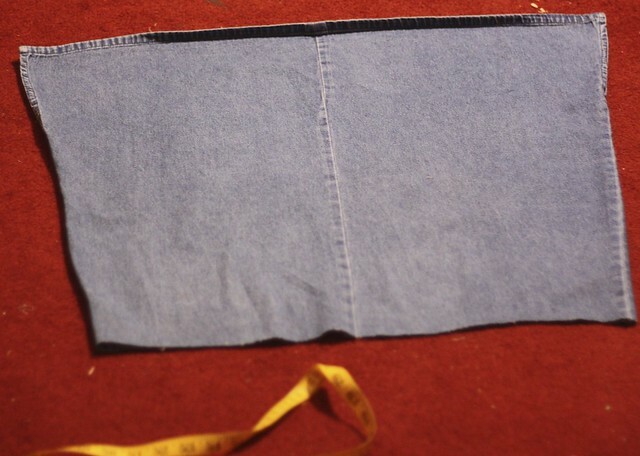 Good thing I did because when sewing clothes with no pattern you end up relying heavily on measurements. Note to self: Take more measurements next time. 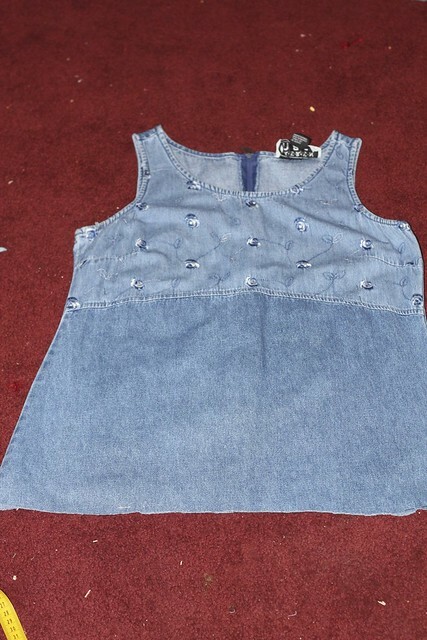 Next the Denim Jumper was spread across the floor and measured to confirm that it was indeed within the realm of possibility to get 3 dresses out of it. Feeling assured that as long as I did not mess something up really badly there should be enough denim convert into the desired 3 dresses. That in mind I proceeded to make the first cuts with fear and trepidation. 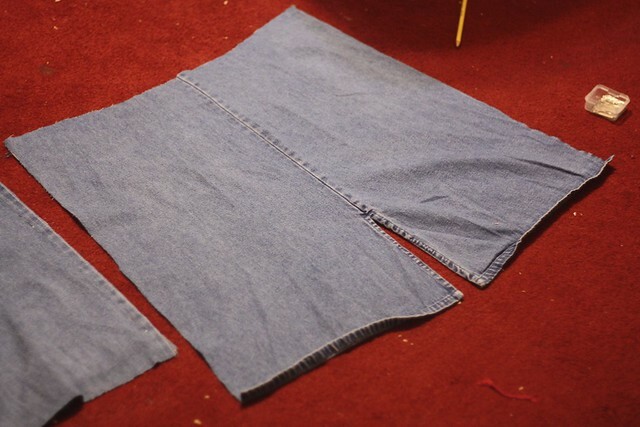 Since the bottom of the skirt had two small slits I figured I could re-purpose them into being individual slits on a sheath style toddler dresses and cut the bottom in half. I saw a clever idea on another re-purposing focused blog where she took an appropriate sized tupper-ware or Pyrex glass round lid and used it to cut arm holes. Since my live model had crashed out for the night already I decided to take a chance and picked out what looked to be an appropriate lid size and cut out two arm-holes. Once that was done I started combing through my pile of fabric and found some left-over pieces from a new-dress project (cut out and waiting to be assembled when I get a chance to borrow a friends sewing machine) Inspired I made two bands that went across the top of the dress forming tie-able sleeves/straps. Hope you noticed that a sewing machine was *not* on my list of available tools at my disposal. So, Netflix Instant Play Streaming on my laptop and a hot cup of Orange Black Tea for reinforcement I whip stitched the dress/shoulders etc. together by hand. It literally took all night but the thought of my wee girlies face to see her “Special dress” when she woke up in the morning and my own personal curiosity to see if I had actually managed to pull off the transition of what was in my head into something wearable in reality drove me on. Once I got the structure of the dress finished it seemed like it was missing something so instead of going to grab a couple of hours sleep I instead grabbed another piece of scrap fabric and my crochet hooks and remnant pieces of bamboo yarn from other projects to put the final touches on the project. All in all I am pleased and more than a little amazed. The fit was more snug than I had hoped for (due to having to take it in an extra 1.5 unexpected inches) but it fits her well and the shoulder ties gave us some lee-way we wouldn’t have had with fitted sleeves or straps. 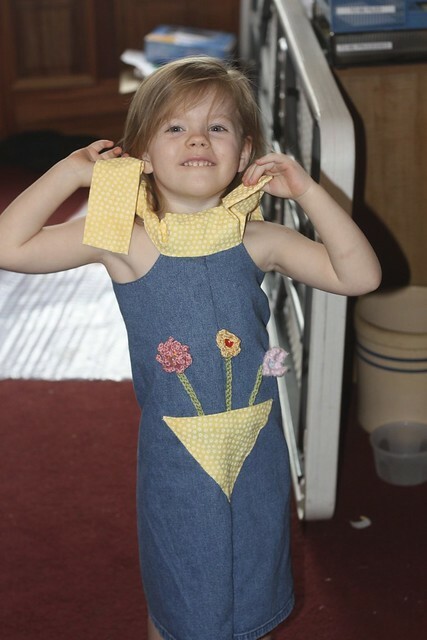 The Doodlebugs was thrilled with her “Special dress!” when she woke up and happily showed it off. Since the Doodles loves pockets I was really thrilled to be able to figure out a way to get her a pocket on the dress. This has inspired me to tackle the next two dresses out of this same project. Hoping to use a friends sewing machine for the next one though and swap the hands on experience for a few hours shut-eye. Anybody else re-purposed/recycled clothes? 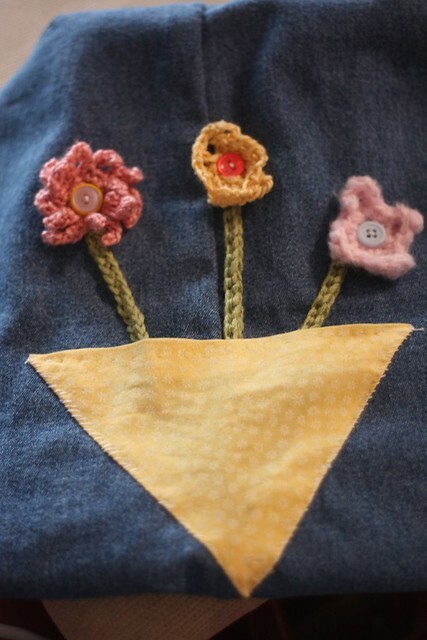 Had great ideas for re-purposing clothes? Tell me about it!